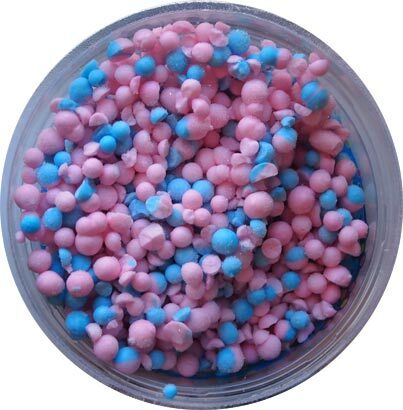 Have you ever had Dippin Dots? 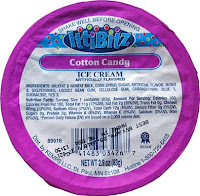 Well, Kemps has a clone called "IttiBitz" and there are currently 8 flavors available. I first reviewed IttiBitz a mighty seven years ago. They didn't leave a very good impression but things have been so very slow and the bitz were only a dollar a cup so I decided to try them again. The funny thing is that very day I bought these, someone left a comment on that old review about how bad this flavor is. "Sweet cotton candy taste captured in tiny, delicious bits of ice cream"
Kind of smells like cotton candy... kind of smells like styrofoam. Some are pink, some blue, some both. Between a weird texture and a weird flavor, it's hard to justify why I would buy this.... but then it hits me, could you use IttiBitz as a sundae topping? Since I'm not enjoying it really (there is an artificial-ness to the aftertaste), I'll save these and try to be creative later. First, I need something salty to counteract all the weirdness here. On Second Scoop: Admittedly these are less offensive on the second try, but I can't imagine ever craving these. I tend to be overly sensitive to texture so it's hard to get past that. There is also something weird about the flavoring... or it could just be the sucralose. Why did they go with sucralose? Ewww. Does it stabilize/freeze better? That might be what's bugging me, but it's the second to last ingredient along with a bunch of other junk. That's probably why people like Dippin Dots better. DD skips the corn syrup and sucralose. Oh well, it was only a dollar. I'm all for sugar free options, but considering this is still rocking 8g....(plus your review), I guess I'll stick to other products! This review made me laugh! Sometimes the best experience is when you have no expectations going in and you end up being blown away. Sorry that wasn't the case here lol. @anon: yeah, the sucralose is probably for cost, not for any health benefit. Very nasty...not at all like dipping dots..the worst flavor...it taste like cream..frozen cream! Terrible excuse for ice cream. No flavor to them! Never will I purchase again.